Offering a wide range of services to suit the needs of your production's budget, veteran AVENUE Q cast member Michelle Lane will train and direct your cast for this fun and challenging show. She will use her extensive training and experience with the original creative team to raise the quality and values of your production. The end result is a phenomenal musical that incorporates puppetry with a HUGE heart, a clear through line and connected actors pursuing their intentions marrying their own bodies to those of the puppets they are working in tandem with. 1-5 days of puppetry technique (depending on your budget and timeline). the live hand puppets in the show, as well as rod work for all the other puppets. Puppetry for the entire show or just the big group numbers - your choice. We have relationships with most of the puppet rental sets available for the show and can help you acquire the best set of puppets available for the dates of your production. AVENUE Q: The University of Arizona and Cal Stage University Northridge. 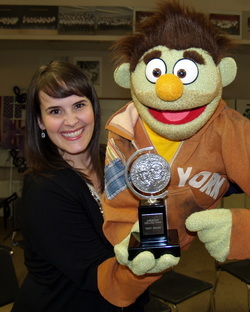 AVENUE Q: SCHOOL EDITION: Calabasas High School (CA) and Basis School (AZ).